KUCHING: Scores of DAP members led by its candidate for Bandar Kuching, Chong Chieng Jen, expressed their dissatisfaction during a protest at MBKS building yesterday over the dismantling of a billboard depicting the picture of Altantuya last week. Similar billboards put up at Stutong Baru and Kuching International Airport were also dismantled. “The reason given by the person who removed the billboards was that ‘Altantuya is not contesting in the 13th General Election, her face can’t appear in the billboards’,” Chong said. He said the (MBKS) action was wrong because there was no notice given to them (DAP) and there was no reasonable explanation given. He added that the EC officer (enforcement unit for P195) had no right to put down their billboards. Also, it was not fair to dismantle the billboards and not BN billboards with ‘non election candidates’ on it. “This is called double standard. Is Prime Minister Datuk Seri Najib Tun Razak contesting here? Why is his face seen on BN’s billboards everywhere? And what about SUPP’s billboards with some unknown faces,” Chong said, adding that the EC officer was also MBKS enforcement officer by the name of Shaharum. Chong added that DAP members had recorded his (Shaharum) action of dismantling the billboards and he was also caught manhandling a female DAP member at the scene. Chong questioned MBKS why it was so scared of Najib seeing the billboards by removing it when he came here. 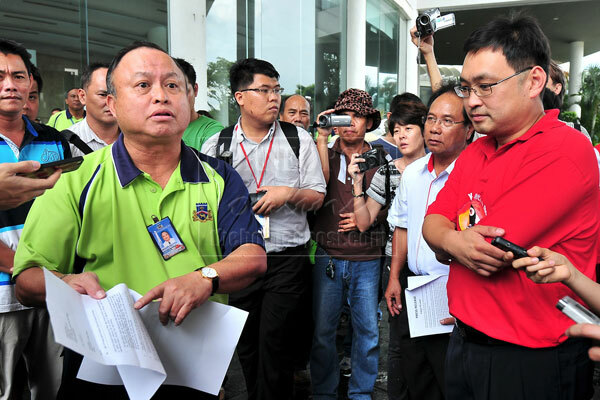 When Chong and his group arrived at the MBKS hall to hand over a complaint letter yesterday afternoon, the main entrance was locked. After a while, its secretary John Lee came out to see Chong to receive the letter. Chong assured his host that it was a friendly protest regarding the dismantling of their billboards. In a little while Mayor James Chan also came and told Chong that the council was not aware of its officer dismantling the billboards.